I believe fully in eating whole foods and not eliminating any one food group, unless totally necessary. For those of you who have followed this blog for a long time, you will know that I am sucrose intolerant. For ease sake, I use the term sugar free when I don’t use sucrose in a recipe. I always substitute my sucrose with fructose, which to be clear, is a fruit sugar. I was recently verbally attacked for this, but I am sticking to my guns by using the words sugar free as today, sugar is commonly associated with sucrose. For people who are lactose intolerant, this raw cheesecake recipe will be perfect. The recipe does not make use of any dairy products. The original recipe calls for agave syrup, which is another sugar substitute. This nectar is locally grown and sweeter than honey but has a very high fructose content and so does not feature in my kitchen at all. I replaced the agave with honey, from local bee hives. The flavour of the honey is determined by the nectar source, and my most recent purchase is Black Ironbark which is truly amazing. Raw cheesecake that uses nuts instead of cheese for the filling. Blog-checking lines: For the August challenge Susan from The Kiwi Cook dared us to make healthy and wholesome raw ‘cheesecakes’ with no cream cheese in sight! What an interesting recipe. I have always note that you provide the sugar and sugar replacement but did not know you could not tolerate sucrose. I have half a bottle of agave in my cupboard that I wantto use and then not re-purchase but every time I go to use it I think ‘What’s that doing to my blood sugars?’. So I don’t use it but I can’t throw it as I can’t bear waste. So it sits there…. Interesting take on cheesecake! Love the variety of nuts in this recipe! Mmm! I love the healthfulness of these! This sounds (and looks) amazing, Tandy. You come up with the most delicious goodies. This dessert is practically health food. Cant wait to try it! Tandy, you are the most transparent blogger that I read! Here’s to sugar free. I love to try raw recipes so will put this in my raw folder. Wow, it must be so hard to find recipes that are sucrose free, especially desert recipes! This however, looks beautiful! Im aways up for pulling a little sugar out of my diet whenever I can so ill certainly be giving this a try! 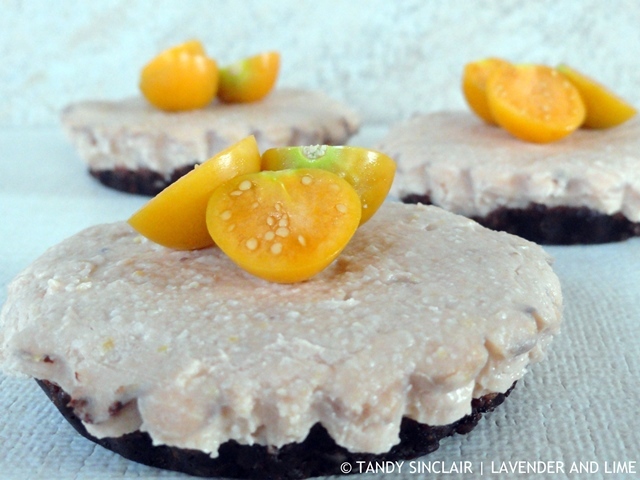 I haven’t dabbled much in raw desserts but this does look pretty good! Have a great weekend Tandy.